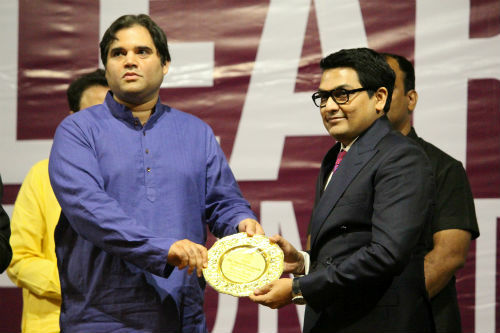 Pune: Varun Gandhi, Loksabha MP, recently interacted with a packed gathering of students from the Ajeenkya DY Patil University, Lohegaon as a part of ‘Learn from the Masters’ Lecture series. Dr Ajeenkya DY Patil, President, Ajeenkya DY Patil University presided over the function. He brought into sharp focus the need to initiate debates in Parliament through the petition system and so also optimum use of RTI, social media and citizen journalism to make voices heard. His lecture was followed by an engrossing interaction with students. Multiple questions raised by a highly charged audience received sharp and focussed responses by Varun Gandhi. He appreciated the confidence of students at the university. Dr. EB Khedkar, Vice Chancellor, Ajeenkya D Y Patil University welcomed the guests while Hrridaysh Deshpande, Director, Ajeenkya D Y Patil University, ​proposed the vote of thanks.